Roscomnadzor suggests that the latest block may restrict some Russians’ access to all of YouTube. Images mixed by Tetyana Lokot. 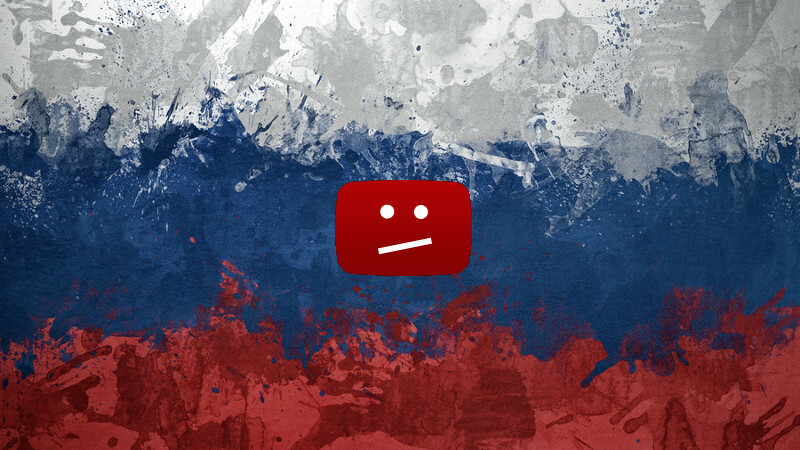 Roscomnadzor, the Russian government's media and Internet watchdog, has issued an official warning to video hosting website YouTube about adding the site to Russia's Internet blacklist for copyright violations. This time, the block could make YouTube completely unavailable to some users. The video hosting is in trouble with Russia's censors because of unauthorized copies of two Russian TV shows, “Chernobyl” and “Fizruk” (“The PE Teacher”) that have popped up on the website. On April 7, the Moscow city court first ruled that the episodes of the shows were uploaded to YouTube in violation of copyright, and had to be removed. YouTube quickly complied, but Roscomnadzor said new copies of the shows’ episodes have been uploaded since then, and counted a total of 137 such offending videos that were still on the website as of July 20. Roscomnadzor doesn’t usually warn sites when it adds them to the RuNet blacklist, but made an exception for YouTube in this particular case, seeing as the website is one of the world's most visited. On July 22, in a post on their official website, Roscomnadzor said it was unclear why YouTube wasn't complying with the latest content removal requests, and said it would place the URLs in question on the blacklist on July 27. If the videos were still up three days later, the webpages would be blocked for users inside Russia. It's worth noting that YouTube pages (including individual videos, user profiles, and channels) have been added to the Russian blacklist registry many times, but in this case Roscomnadzor saw fit to draw attention to the possibility of the website being completely unavailable for some Russian users, ostensibly because of the HTTPS encryption protocol used by YouTube, which prevents some ISPs from filtering traffic. По истечении трех рабочих дней в случае неудаления противозаконной информации доступ к этим ссылкам будет ограничен операторами связи. Это может привести к тому, что для абонентов отдельных интернет-провайдеров будет ограничен доступ ко всему сервису YouTube. After three business days, if the unlawful information is not removed, access to these URLs will be restricted by ISPs. This can mean that subscribers of some ISPs will have no access to the entirety of the YouTube service. Roscomnadzor said it expects YouTube to fully comply with the court order on the matter. When reached for comment by Vedomosti, a representative for Google (which owns YouTube) said they were “looking into the situation” and would issue an official reaction later. You can easily access Youtube in Russia if it got banned using a VPN service, like PureVPN.